Deninet Review 2019: Is Deninet a Good Hosting? A Hungarian provider specializing in enterprise-level website hosting. They offer only dedicated server rental and colocation, with no shared hosting. They have two base packages with a range of optional configurations. Deninet is a hosting provider located in Hungary. They do not offer shared hosting, instead, they focus on dedicated servers and collocation. Unfortunately, there is not a huge amount of information about what they do, so it’s not clear how long they’ve been in business or how many customer they have. This may suggest they are a new or small business. Their website is available in English and Hungarian, as is their support. 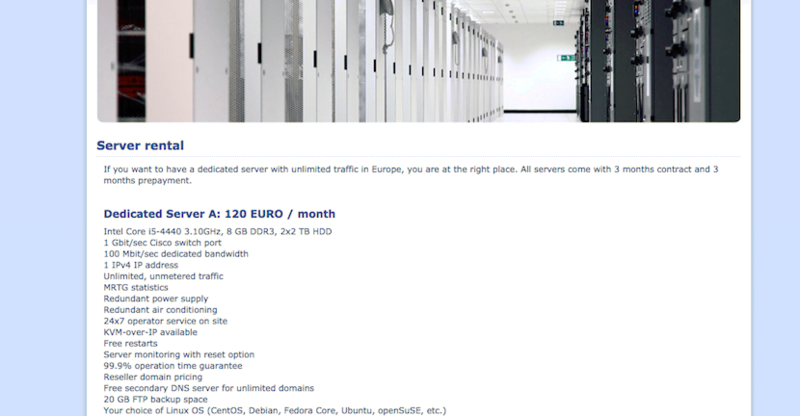 The first thing that struck me about Deninet’s service is that they only offer two dedicated server packages. However, upon checkout, it becomes clear there are options to change the configuration of these two base packages. It’s possible to choose the brand of the server, the amount of Hungarian and international bandwidth, the operating system, the number of IP addresses, firewall, remote reboot, and more. Whilst these configurations do increase the price, it is certainly a flexible way to configure your server. Their hardware is good quality; their dedicated servers feature Intel Core i5-4440 3.10GHz, 1 Gbit/sec Cisco switch port, 100 Mbit/sec dedicated bandwidth, and 1 IPv4 IP address, as well as unlimited, unmetered traffic. They have engineers on site 24/7, free restarts, and server monitoring with reset option. In terms of a dedicated server rental, they are easy to pay and get setup. Many companies do not allow you to purchase and configure your server online, while Deninet does. What’s more, they will get you set up within seventy-two hours. The prices are quite expensive when compared to other companies providing a similar dedicated server package, especially when considering the cost of the add-ons. That said, Deninet are clearly specialists in dedicated website hosting and they are an excellent choice if you want to have a dedicated server with unlimited traffic in Europe. Their contract terms are all refreshingly simple. They provide a monthly price, dependent on your configurations, which is paid upfront in three month instalments. It’s important to consider, there is a setup charge for some of their customizations and they don’t offer any incentives, discounts, free trials, or money-back guarantees. Their customer service options are quite limited. They have a telephone number, email address, and online contact form. They provide support in Hungarian via their website and they direct you to another website to get support in English, which is a little confusing. I have contacted them a few times via email and unfortunately, their service is a little bit slow. They do not have a knowledge base or help desk on their website, however, this does make sense as they only offer dedicated servers which are managed by 24/7 on-site engineers. Deninet offers dedicated server rental suitable for enterprises. Their hardware is good quality with redundant power supply and air conditioning, unlimited, unmetered traffic, your choice of Linux OS (CentOS, Debian, Fedora Core, Ubuntu, openSuSE, etc. ), plus 24/7 on-site engineers. Wondering how Deninet stacks up against other Web Hosting companies? Enter any other Web Hosting company and we will give you a side-by-side comparison.